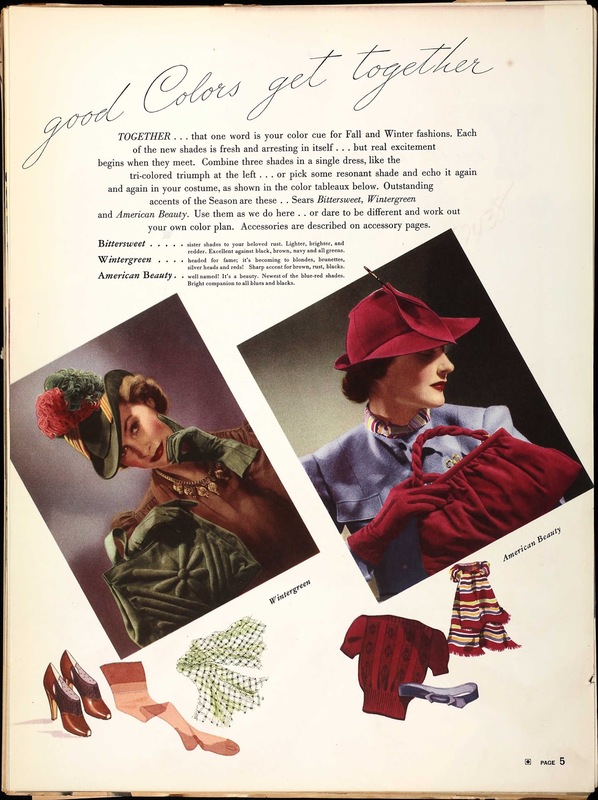 I came across a color scan of the 1939 Sears catalogue photo that is also pictured (in black and white) in the Everyday Fashions of the Thirties. The page describes two popular color schemes during the year. I've always wondered what exactly they looked like (since I had only seen the black and white versions)! Aren't they great? I would love to find some fabric in the reddish blue similar to the 'American Beauty' above. I, of course, also love the Wintergreen color! Which is your favorite? I love the raspberry! Though right now, I seem to be wearing a lot of wintergreen. And wintergreen sounds so much better than drab olive! I love the raspberry with the pale blue! Pretty yet unexpected. I agree with Elle, wintergreen is a great colour name! I love them both, but I think the raspberry is my favorite by a small margin. Both the rasberry and wintergreen are spectacular, I really love them both and share your sentiments about finding fabric in those shades.....I love all the colour combinations during that era....the outfits looked so 'put together'. I love t he wintergreen!! The color is so rich and luxe!! I love the elegant names they've given the colour schemes; it makes them more fabulous! :) I love them both, as they are both colours that I wear regularly. Love the polka dot blouse! I'm planning on making a red pin dot one for myself this spring. I would seriously struggle to pick a colour as they are both so gorgeous..although the wintergreen would probably suit me better. What elegant pictures! Green for me! I can't stop buying green fabrics. I would have to go with Wintergreen but I might be skewed. I have been buying so many different green fabrics lately for some reason and the American Beauty would not work on me. I looooooove the green one. Both of those are gorgeous but the green is absolutely stunning. Hi Debi, you probably saw Mena's post over at Sew Weekly, but ancestry.com has all of the Sears catalogues posted - I spotted this there too. You can get a free 2 week membership and download images that you like as long as it's not the bulk of the document. I may end up paying for one month of membership as I don't want to spend all my time at the computer for 2 weeks! For a long time I've wanted to incorporate gray as a basic in my wardrobe but I could never find the right gray but recently I just bit the bullet and bought a sweater jacket in a medium gray then spent an hour trying it on with various things and what I liked best was burgundy. So, I'd have to vote for that combo but the green/brown combo is inspiring too. thanks for sharing. LOVE LOVE LOVE the Wintergreen bag. Great catalog page! You look so cute in your polka dot blouse! I think that the Wintergreen combo is my favorite - but maybe it's because, like Serendipity, I LOVE that green purse! Is that trapunto quilting? I think both are great colors because they compliment each other so well. I've always wanted to know exactly what shade of red American Beauty is, so thank you! I love the green hat, so classy. Ooh I love those colours!